We hereby publish the first report in the User Interviews User-evaluation of the implementation of drug-free mental health care services. 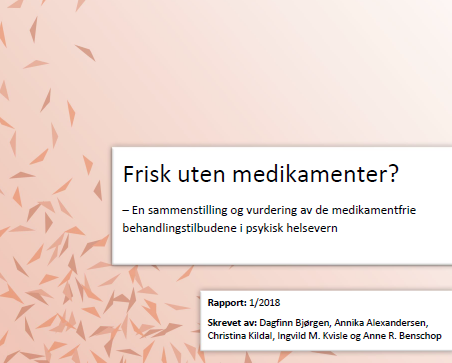 Implementation of new drug-free mental health care units was a demand to the Regional Health Authorities from The Ministry of Health and Care Services in 2016, on the basis of demands from “Fellesaksjonen for medisinfrie behandlingsløp” (“Joint Action for Drug-Free Treatment in Psychiatry”). KBT was commissioned by the Norwegian Directorate of Health through the Central Norway Regional Health Authority to create an overview and descriptions of the implementation of drug-free mental health care services in Norwegian hospitals. This report shows an early overview and the status of implementation by 14th of May 2018. The units are still a work in progress. The findings in this report are based on document analysis of the regional protocols, project descriptions, e-mail and phone questionnaires, web pages, network meetings and conferences. A total of 56 beds divided between 14 hospital units have been earmarked for drug-free treatment. Most of the drug-free units are implemented as part of ordinary hospital units. Download the report here (with an abstract in english). Prosject Team Member. Working with user influence for children and youth, User Interviews User-projects and writing articles for web.